Leverkusen - Bayer 04 Leverkusen returned to winning ways with a narrow 1-0 victory over FC Augsburg at a rain-soaked BayArena. Heung-Min Son grabbed the only goal of the game in the 33rd minute, firing past Marwin Hitz for his second goal of the season. Augsburg pressed for an equaliser in the second half, but the hosts held on for a deserved three points. Having been rested for die Werkself’s defeat by VfL Wolfsburg at the weekend, Stefan Kießling returned to the Leverkusen starting line-up along with South Korean international Son. Kießling, who had scored seven goals in as many games against the Bavarians prior to the Matchday 5 encounter, almost gave the hosts the lead inside five minutes, but his shot was blocked and eventually cleared by Paul Verhaegh. Augsburg were happy to sit back and play on the break, but when Markus Weinzierl’s charges did venture forward they caused Bayer’s defence more than a few problems. Sascha Mölders and Tobias Werner both saw headers flash wide of the target, before Karim Bellarabi’s effort was ruled out for offside at the other end. The visitors were forced into an early substitution as the half-hour mark approached, with Brazilian Caiuby replacing the injured Mölders, who was clearly in some distress as he left the field. Things got worse for die Fuggerstädter moments later when Son latched onto Roberto Hilbert’s defence-splitting pass and side-footed the ball past Hitz to give Leverkusen the lead. Rain momentarily suspended play towards the end of the first half, but both teams appeared unperturbed by the increasingly treacherous conditions inside the BayArena. Son flashed a curling effort wide of Hitz’s right-hand post, before Caiuby sent a looping header into the arms of Bernd Leno. Son tried his luck with another powerful shot moments later, but the 22-year-old again failed to to test the visiting keeper. Moments after Sebastian Boenisch had screwed another attempt off target, Augsburg almost snatched an equaliser. Raul Bobadilla played the ball through to Caiuby inside the area, but Leverkusen keeper Leno was out quickly to deny the striker with a smart save. 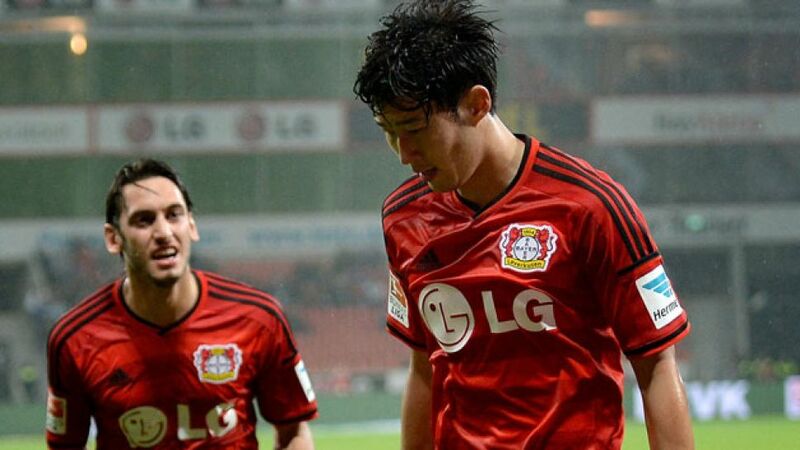 Hitz then followed suit with a point-blank stop from the onrushing Kießling. The action continued to swing from end to end as the second half wore on. Hilbert did well to clear Alexander Esswein’s low cross out for a corner, before Kießling wasted a glorious chance to slip Swiss international Josip Drmic through at the other end. Leno was forced into another fine stop to deny Esswein in the final stages, but Bayer held on to stretch their winning run over Augsburg to seven matches.